By chance, a collision of two galaxies has created a surprisingly recognizable shape on a cosmic scale - The Cartwheel Galaxy. The Cartwheel is part of a group of galaxies about 400 million light years away in the constellation Sculptor (two smaller galaxies in the group are visible below and left). Its rim is an immense ring-like structure over 100,000 light years in diameter, composed of star forming regions filled with extremely bright, massive stars. When galaxies collide they pass through each other, their individual stars do not come into contact. However, this ring-like shape is the result of gravitational disruption caused by a smaller galaxy passing through a large one, compressing the interstellar gas and dust and causing a star formation wave to move out like a ripple across the surface of a pond. 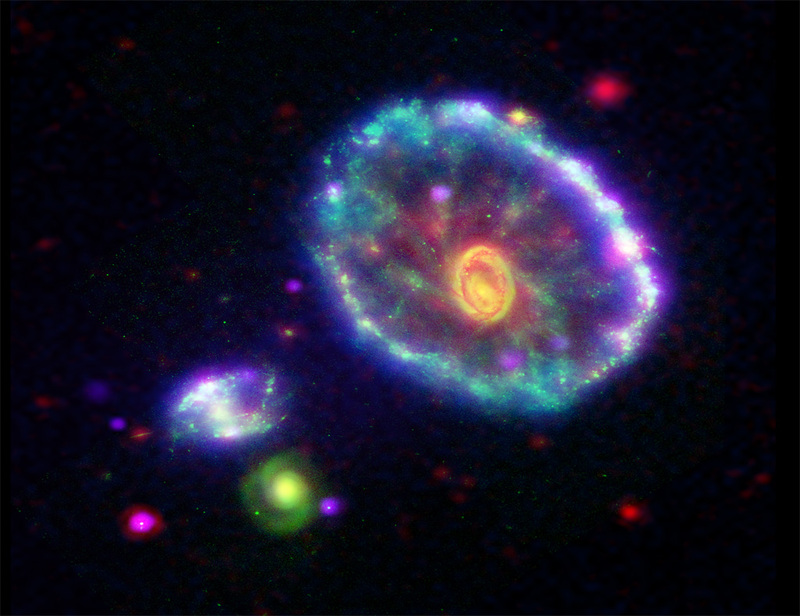 This false-color composite image of the Cartwheel Galaxy is from space-based observatories. The Chandra X-ray Observatory data is in purple, the Galaxy Evolution Explorer ultraviolet view is in blue, the Hubble Space Telescope visible light picture is in green and the Spitzer Space Telescope infrared image is in red.